The 2019 Challenge shall be judged by this year’s Tutors. Theme: ‘LIVING WORLD’. Maximum size 50 x 50 cm (19.7 x 19.7 inches). Lots of scope for you to explore, be creative and have fun. Do not put your name on the pieces, alternatively cover your label with a dark piece of fabric tacked on for the judging. All pieces will be on display throughout the weekend. One piece per member only, please. 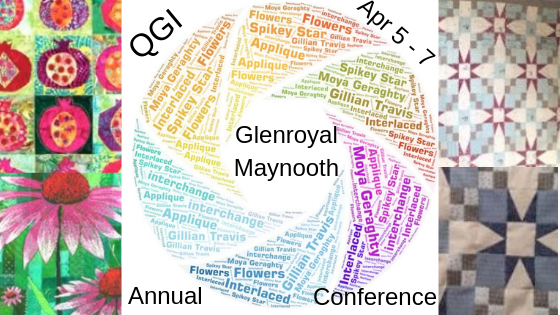 “Past Pieces” refers to a piece of work started at ANY previous QGI Conference, and which has not been shown at a previous Conference. You are invited to bring along your finished piece, which will be displayed over the weekend. One piece per member will be displayed. If you have more items from previous Conferences, and not previously displayed, bring them for the Show and Tell. An absolute favourite with everyone, especially the hotel housekeeping staff, who love getting involved and take this very seriously. Bring a quilt to leave on your bed. On Saturday morning while you are working away at the workshop of your choice, the hotel housekeeping staff will select their three favourite quilts. After the AGM on Friday evening, we will have a Show and Tell. Bring your quilts – any size – for us to admire, ‘Ohs and Ahs’ and be inspired.